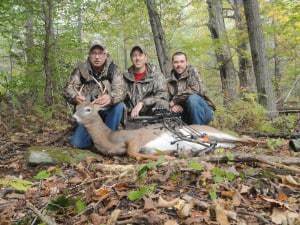 NH Archery: Hunt 7 - Dad’s Buck - the4pointer.com | Real Hunts. Unreal Stories. Conditions: Warm with temps in the upper 60’s. Light wind. “The problem is that I was aiming at the lower right circle.” He replied. After a half hour of shooting his sights were dialed back in and he was actually hitting the target he was aiming at. He took a break before heading to the woods but I left right away because I needed some extra time to move my tree stand. I had a particular spot in mind that I hadn’t checked yet this year. It’s a great spot that takes a while to get to but the big bucks roam there so it’s worth the effort. After an hour of hiking I finally found a decent tree and got set up. Just before I climbed up I noticed a scrape under a young beech tree about 15 yards from my tree. I have read about bucks scraping this early in the year but I had never seen it before. It was clearly a scrape, though, located right underneath a licking branch and on the edge of a logging road. It was a day or two old but there was still a distinct deer track right in the middle of it. The discovery of the scrape gave me quite a boost in excitement as settled in. By then, Josh and Dad were both settled in their stands and the waiting game began. At about 6 pm Dad called to tell me he had hit a nice buck. Upon my asking he told me it had to have been a good shot because there was a big tree covering the hind end and a big tree covering the front end. The only area left exposed was the vitals. The buck was 22 yards away and standing broadside. The deer had taken off on a dead run after the shot but the arrow had stayed in it. We decided that I would sit still for another 45 minutes and then make my way to him just before dark. As it turned out, I got there after dark and discovered that my head lamp was dead. It is fairly typical of me to discover that I am unprepared but this was particularly bad timing. Dad had only found a couple drops of blood and by the light of my iPhone flashlight we had only found a few more. By the time the blood trail dried up we were only about 100 yards from his stand and still had not found the arrow. The 3 of us searched for another hour and it became obvious that it was a fruitless endeavor. Dad was obviously frustrated, knowing that the shot had been good, and yet we still had come up empty handed. We circled our way back to the trucks (not because we were looking for the deer but because I was a poor navigator in the dark) and made a plan to be back at daylight to resume the search. The search started off the same way it had ended the night before –depressing. Even in the light of day there was no blood trail and the ground was so dry that we couldn’t even find his hoof prints to follow. For the next hour we just walked circles in the general direction he had been running. Like any other search for a wounded deer, enthusiasm continued to fade as time passed. We checked every nook and cranny to no avail. Then, in an instant it all changed. Like Dad so often does, he came across some blood. It was about 150 yards from the last speck we found but it was definitely blood and all hope was immediately restored. I was approximately 100 yards below him on the brushy hillside and I let him know I was going to check a ravine that was close by on my way up to him. I walked over to the ravine and there lying on the ground was his deer! Talk about excited! 30 seconds earlier the three of us were feeling pretty disappointed, especially Dad, and then just like that it all changed. After high fives and pictures we got to work getting him home. Thanks to a cool night and lack of coyotes the deer was still in good condition. Just like Dad had said, the shot placement was perfect. Looking at the hole in the picture you would think that it was a double-lung pass through, but it wasn’t. Since he had run off with the arrow (which we still have not found) I had assumed it had gone in and lodged in the off shoulder. I had found it odd that the deer hadn’t snapped it off at some point while running but I really couldn’t think of another possibility. However, when I skinned out the deer I discovered that the arrow had hit a rib dead center and deflected 90 degrees lodging in the base of the neck. It had sliced up a lung on the way by but the deer still ran 350 yards and didn’t start bleeding profusely until the last 40-50 yards. I am slightly concerned at this but on the positive side, the expandable blade deployed properly as there were 3 nice cuts in the entry wound. Also, the hole in the hide was approximately 2” long, but some of that could have been from the arrow slamming against trees while the deer was running. 1. 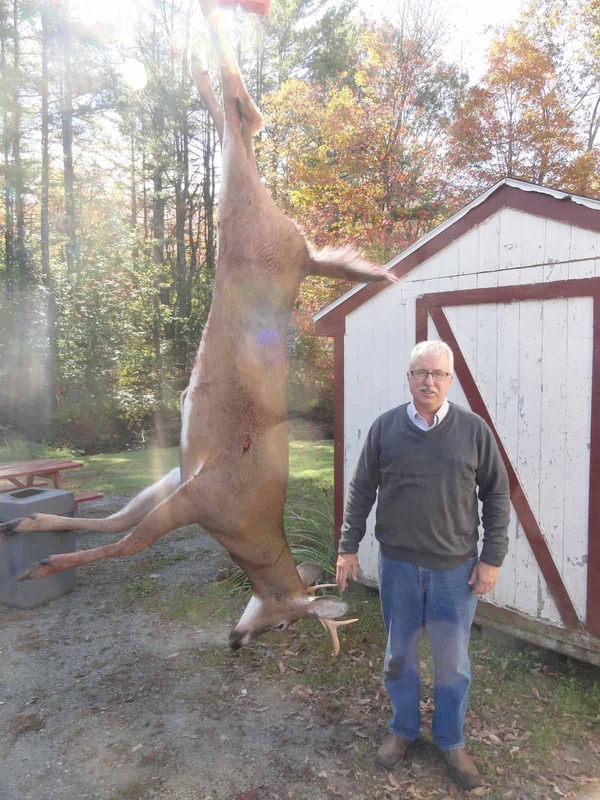 I certainly learned something new about what can happen when an arrow hits a deer. I’ve read stories about such things, but experience is a far better mentor. Now I KNOW hitting a deer perfect doesn’t always result in a perfect outcome. As I mentioned above, the deer ran about 350 yards leaving little to no blood until the end. I now know that deer can run much further than I thought possible even after a “Perfect” shot. 2. Believe it or not, this buck came into a call. Dad had used his Primos Can Call and a few minutes later this guy came to within 22 yards of his stand rubbing trees along the way. Don’t write off early season calling! 4. Don’t give up until you are 100% sure you will not find a wounded deer, and when you are 100% sure search some more. We were still a ways from giving up but we were all pretty down. Circumstances can turn around in an instant. Back in 2004 Dad shot a small buck with his bow. I had made my way over to him and we were standing on the spot where he had hit the deer. At the time, the Yankees had a 2-0 lead on the Red Sox in the ALCS and it wasn’t looking good. Dad had never gotten a deer with a bow so as we stood there I uttered prophetic words that will live forever in our family. I said, “Dad, if we find this deer that means the Red Sox will win the World Series.” 80 yards later we found his buck and the rest is history. I’m not ready to offer any prophetic utterances just yet, but I will say that there were two miracles that took place back in 2004 and Dad has already done his part this year. Could it be that the Red Sox will…? I better not say anything.